Reservoir engineering is what William (Bill) Rossen, American-born Professor in Petroleum Engineering at the faculty of Civil Engineering and Geosciences, specialises in. It focuses on the central question of how to get the most from the stocks of crude oil and natural gas hidden deep within the Earth. Rossen is fascinated by techniques involving the injection of foam into underground strata in order to increase the pressure and force as much fossil fuel as possible to the surface. His other passion involves getting the best from his students. This dynamic lecturer was awarded for his efforts and creativity in the lecture hall by being voted ‘best teacher’ at TU Delft in 2011. 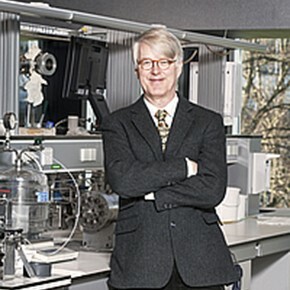 In 1982, he was awarded his PhD and after several years of research for Chevron and working as an academic at the University of Austin (Texas), he came into contact with Hans Bruining, a researcher from TU Delft who was spending a year working in the US. When Rossen said he would like to visit Shell in the Netherlands, Bruining responded by saying ‘do not plan anything, let my students of mining organise the whole programme for you.’ ‘They arranged everything perfectly,’ says Rossen. He and his wife became regular visitors to Delft and when the chair in reservoir engineering became vacant six years ago, he applied and got the job. The good contacts with students have remained: he can regularly be found in the Delft Mining Association’s pub at Noordeinde. There are various ways of maximising the yield of an oilfield. Of course, extraction leads to a drop in the geological pressure and eventually the engineers need to increase the pressure again from above in order to force the oil or gas to the surface. This can be achieved by injecting steam, CO2 or carbohydrates. Or by spraying foam into the pit. An oilfield is not a large hollow space, but is often a layer of porous stone in which the ‘black gold’ is stored in tiny channels. Just like a pile of sand, in which there is air between the grains. The challenge is to create a foam in which the soap bubbles have just the right shape and the right chemical composition (more stable than soap), are injected at the right position relative to gravity and the position of the drilling hole and are shaped so that they can move through the capillary space in the porous stone. In a nutshell, that is Rossen’s field of research. It is about the chemistry between water, oil and gas. In his words, ‘they don’t like each other’ and want to stay apart. But under what conditions will they actually mix? He examines this question not only hundreds of metres deep in the Earth in extreme chemical and physical conditions, but also in everyday life. ‘How is it that you sometimes find a puddle in the car park with a layer of oil on top of it that has leaked from an engine? Or what happens if you add a drop of oil to the water when you are cooking pasta?’ Rossen is not one to shy away from bringing a jar of mayonnaise or can of shaving foam along to the lecture hall to get students thinking about the physical phenomena that make a foam or an emulsion take on the form of a solid or liquid. This is evidently Rossen’s main mission in life. Students are captivated by the way in which he provides advance information on the content of the upcoming lectures so that everyone can prepare, by his willingness to continue explaining complex issues until everyone understands and his inspirational and enthusiastic lecturing style. In order to encourage interaction in the lecture hall, Rossen regularly compels his students to devise questions (in exchange for credits) about everyday or curious physical phenomena or problems. These may range from ‘why does the sink drain so slowly’ to ‘how does the ice in a glacier move?’.